Spiritual wedding readings are becoming increasingly popular with couples tying the knot. Whether they’re looking to break away from religious traditions or express their personal beliefs, many couples find that a spiritual reading can give their big day that unique touch. Is there that one poem that seems to have stuck with you for years? Perhaps it gives you chills whenever you hear it or you find yourself reciting it line for line on a regular basis. If so, why not include it in your reading? If you’re unfamiliar with poetry, it’s not too late to read up on some of the greats. Have a look online for the works of E. E. Cummings, Lord Byron, and Carol Ann Duffy – just a few poets known for their romantic words. You never know, these poems might also provide you with valuable enlightenment in other aspects of your life. Proverbs are wise sayings that offer advice on how to live life. If you’re struggling to decide what to include in your reading, proverbs could provide you with the inspiration needed. If you’re feeling really creative, why not look to the stars for inspiration on your reading. Even if you don’t share the same personality traits, perhaps your signs complement each other perfectly by championing your strengths while making up for one another’s shortfalls. 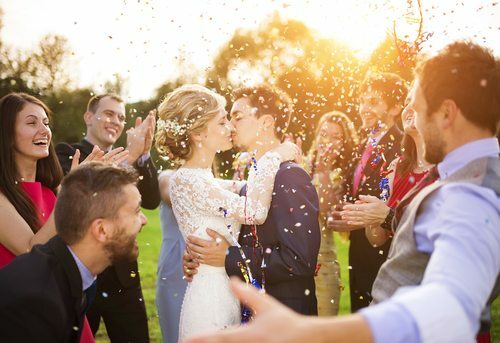 You could even incorporate your star signs into your vows by promising to make the most of your best qualities while also pledging to improve your shortfalls. Why not take inspiration from your favourite authors and scatter snippets of your favourite books throughout your readings? You could read a long extract in its entirety or combine small passages together. By mixing different extracts together you can really personalise your reading and find one that perfectly captures the love between yourself and your partner. The best thing about choosing a spiritual wedding reading is that it opens up a world of possibilities and enables you to be creative while adding a unique touch to your wedding.